The Hottest trend in uniform fashion! 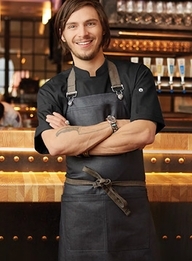 Chef Works hits the mark with their "Urban Chic" Denim Apron Collection. These street-inspired denim aprons combine edgy fashion with forward thinking functionality. 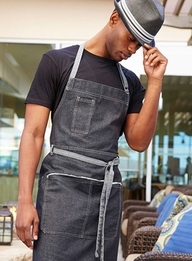 These denim aprons are hip, their unisex styling will appeal to your entire staff. Their casual, down to earth attitude speaks as loudly as their comfortable, timeless indigo hues. 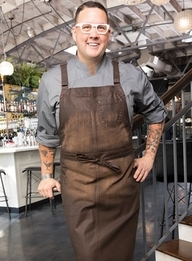 With raw frayed edges, retro and zipper pocketing, contrasting ties and the soft hand of denim, these denim aprons are the perfect solution for chefs and food servers alike. They'll be right at home in your urban chic cafe, hip coffee house or trendy food truck. The true character of these denim aprons will develop with time. 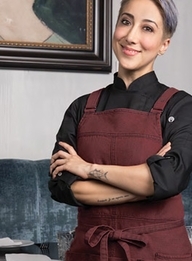 The Urban Denim Apron is available in full bib, trendy waist apron and half bistro in a selection of denim fabrics, The fabrics include solid colors ,stripes and printed denims in 100% Cotton as well as a textured Cotton poly mix. Most of the aprons in the Urban denim apron collection are available in indigo blue or black denim.